Lieutenant (jg) Howard C. Latham of Esmond served aboard the ill fated USS Escolar during World War II. On September 18, 1944, the American submarine USS Escolar (SS-294) slipped out of Pearl Harbor and into the Pacific to rendezvous with two other subs, the USS Croaker (SS-246) and the USS Perch (SS-313). The Escolar was captained by Commander William J. Millican who was to take command of the three sub “task force” and lead them on a search and destroy mission against Japanese shipping in the East China Sea and Yellow Sea. 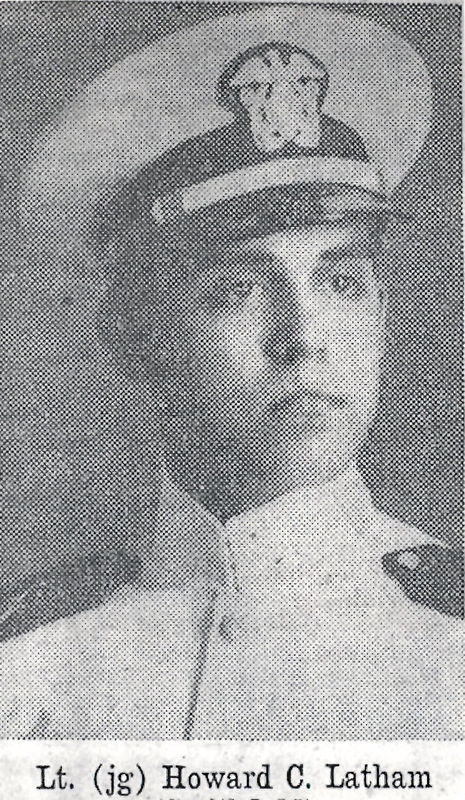 Aboard the Escolar was 22-year-old Lieutenant (jg) Howard C. Latham, of Esmond, Rhode Island. Born in Georgiaville, he grew up in Smithfield and attended local schools. 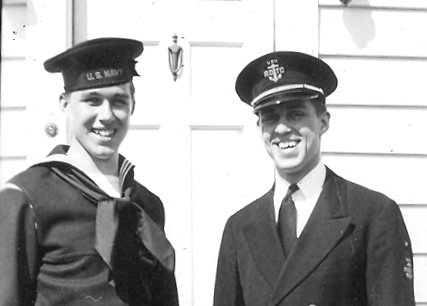 After enlisting in the Navy, he was commissioned an officer, and volunteered for submarine duty. The Escolar was state-of-the-art for her time – the latest and greatest in submarine technology, having been commissioned a mere four months earlier. She was just shy of 312 feet long, powered by four diesel-electric engines, and carried a crew complement of 10 officers and 72 enlisted men. Her armament included twenty-four torpedoes and three deck guns for surface defense. World War II era subs were named for fish. An escolar is a predatory fish found in deep waters around the world that can grow to two feet in length. This was to be the Escolar’s first combat patrol of the war, and the crew was eager for action. The men had even given a nick-name to the task force – “Millican’s Marauders”. Once in the designated patrol area of the northern Pacific, each sub went off on its own in search of prey. In this manner, they could cover more ocean and not interfere with each other when stalking a target. On September 30th, Escolar radioed that she was under attack by a boat with a deck gun. The message was picked up by an Allied listening post in the Bonin Islands, a string of islands about 620 miles south of Japan. The post reported that the transmission had abruptly broken off with no further details given, but based on the signal’s strength, it was estimated that Escolar was somewhere to the north of the islands. The likely reason for the interrupted message was that Captain Millican had ordered an immediate dive to escape the hostile gun fire. Whatever battle damage Escolar might have suffered is not recorded, but it is presumed not have been bad enough for her to abandon her mission and put into port for repairs. Nor was it bad enough to rendezvous with Perch or Croaker for help, for she maintained radio contact with both subs into mid-October. The Navy waited for some word as to the fate of the missing sub. If she had been sunk, perhaps there had been survivors, and possibly some of those survivors were stranded on one of the many uninhabited islands that dot her designated patrol sector of the pacific. Word could also come that some of the men had been taken prisoner by the Japanese, but no word ever came. The USS Escolar was never heard from again. The loss of the Escolar wasn’t made public until February 28, 1945. A month later Mr. and Mrs. Earl M. Latham Sr. of Esmond Street were notified that Howard was “missing in action”. Howard left behind his parents, a brother Earl, who was also serving in the Navy, and a pretty young wife, Dorothy, whom he had married September 30, 1943. What happened to the USS Escolar is one of the many enduring mysteries of World War II. Historians researching her disappearance have focused on three possibilities. The first theory involves faulty workmanship during construction which could have led to an operational or structural defect. The original shipyard charged with her construction went out of business due to mismanagement and labor difficulties, so the Escolar, and several other partially built submarines, were completed by another shipyard. The second possibility is that she was destroyed by enemy ships with depth charges. After the war, Japanese naval records revealed two encounters with an “unknown submarine” in the approximate area where Escolar would have been on patrol. One occurred October, 19, 1944, and the other on October 22. In both cases destruction of the unidentified submarines was confirmed by oil slicks and debris fields. There were no survivors in either case. The third and most accepted scenario is that Escolar struck an undersea mine and was destroyed. Areas of her patrol sector were known to be mined, and although the locations of some mine fields were known to the Allies, it’s likely there were some that were not. The Escolar was gone but not forgotten. In January of 1977, ground breaking ceremonies took place just outside the U.S. Naval Weapons Station in Seal Beach, California, for the construction of a memorial honoring all submarine crews lost during World War II. At this memorial is a large bronze plaque dedicated to the memory of the USS Escolar, with the names of every crewman aboard when she disappeared, including Lt. (jg) Howard C. Latham. One could ask why men volunteered for such duty, and one would likely get a different answer from each man who served. Thankfully they did, for the United States Submarine Service no doubt saved Allied lives and shortened the war by attacking enemy war ships, and preventing supplies from being delivered to enemy troops. According to the United States Submarine Veterans of World War II, a congressionally chartered organization, 3,505 submarine crewmen were lost during the war. The official website for the Chief of Naval Operations, Submarine Warfare Division, states that a total of 288 submarines were deployed by the Unites States Navy during World War II. Of that number, 52 are still on eternal patrol, their fate known but to God. The USS Escolar is one of them. May 26th is Memorial Day, the day we remember all who have died in the service of our nation. Not the preacher who gave us freedom of religion. Not the reporter who gave us freedom of the press. Not the poet who gave us freedom of speech. Not the community organizer who gave us freedom to assemble. Not the lawyer who gave us right to a fair trial. Not the politician who gave us the right to vote. Those that served and never came home are the heroes who gave up their tomorrows so that you could have yours.